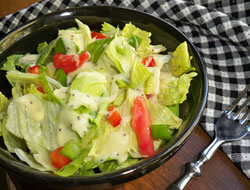 A throw together lettuce salad to enjoy with your favorite salad dressing. Great to serve with any type of meal. Tear or cut the iceberg and romaine lettuce into bite-size pieces. Toss the iceberg and romaine lettuce together. Dice the green peppers, red peppers, and tomatoes; toss with the lettuce. Serve with everyone's favorite salad dressing. This salad can be served with croutons and bacon bits if desired. Note: Add any seasonal vegetables that you would like to make this your favorite salad. 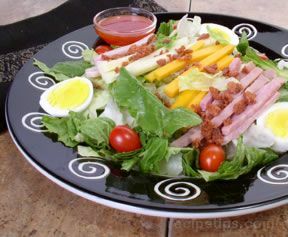 "This is an easy throw together salad that would go perfect with any type of meal. We had it with steaks and it was the only side dish we had, which made for a great light dinner. 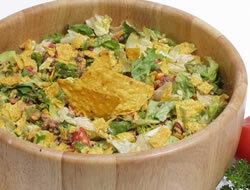 I liked the mixture of the two lettuces."